Teltronic Towers was incorporated in 1969 and is located in Capitol Heights, Maryland. Robert Walker the President, Jeff Tinio the Vice President and Gary Dathe who is a consultant & former President: together have over 75 years of combined Tower, Construction and Management experience. Teltronic Towers is one of the original founding members of NATE – the National Association of Tower Erectors and was recently recognized as one of twelve original founding members still active and in business. We currently employ 31 people which includes four antenna & line crews (construction crews), two system analyzation crews (sweep crews) and a team of construction / project managers. 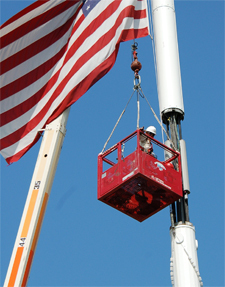 Teltronic Towers is a full service General Contractor for tower construction and tower related services. 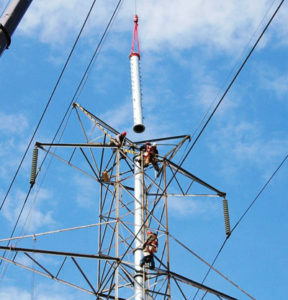 The core business is rooted in the construction and maintenance of all types of towers; self-support, monopole, guyed, stealth and water tanks. Our expertise lies in the ability to work at extreme heights and high angle jobs. Through the years the company has provided many tower related services such as; sweep testing, antenna & line installation & troubleshooting, tower lighting, point to point microwave services, guy wire work, structural enhancements & modifications, cellular, radio, tower painting, cameras & surveillance installations and other tower equipment. We are familiar with all types of tower lighting systems and trained in Flash Technology Systems. In addition, Teltronic Towers is capable of providing professional services for engineering firms regarding tower mappings, structural analysis and line of site determination. Teltronic Towers is able to provide turnkey solutions for clients who wish have an entire tower and compound constructed. Construction management, compound, civil, electrical and deep pier foundations are among some of the services that can be provided. Teltronic Towers is contracted directly and indirectly for the local municipalities on many different aspects of communications projects on buildings and towers. We are engaged with various public and private sector entities and qualified to work on many of the local power company energized towers. All of Teltronic Towers’ climbers are trained and certified to work at heights and for high angle rescue. Teltronic Towers has prided itself in its impeccable safety record and is constantly striving to improve the safe environment it provides by ongoing training and continuing education. Safety is of the upmost importance and a mantra practiced by everyone throughout the company and we have received various safety awards through the years. Our goal is to exceed the expectations of every client by offering outstanding customer service. Our mission is to create a customer experience that results in repeat business from each and every client. We treat our customers with a friendly attitude that exemplifies our desire and willingness to earn their respect. Day by day and job by job, nothing is to be taken for granted and every transaction is equally important.